While looking for a place to eat after dropping by the Mommy Mundo Bazaaar, we chanced upon a homemade ice cream stand at the concourse level of Rockwell Power Plant Mall last Saturday. My 6-year-old son, a certified ice cream lover, didn’t fail to notice it, and he asked his Dad for money to buy a cup of homemade cheese ice cream. A cup costs Php40.00, and they are offering two flavors: mango and cheese. The mamang sorbetero (ice cream man) was kind enough to give me another small spoon because he noticed I was keen on tasting the ice cream, too. One spoonful was all I need to realize that this ice cream was creamy and delicious. It had real cheese bits in every bite, which made it more fun and exciting to eat. It’s no wonder my son finished it in no time. 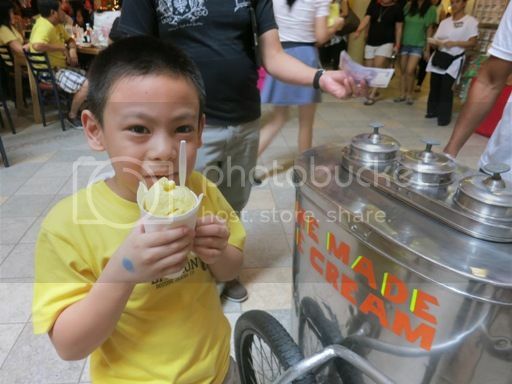 Next time we visit Rockwell Power Plant Mall, I’ll try their homemade mango ice cream, too. This entry was posted in Homemade Ice Cream, Rockwell Power Plant Mall. Bookmark the permalink. I bet that tasted delicious! I love mango flavored ice cream but unfortunately, there’s none here. I miss those kind of ice cream. I’m sure it is so good. I grew up with ice cream as my daily dessert. We used to own a dirty ice cream factory. Wow! 40 pesos na pala ang isang cup. how time flies. At least yummy yan. Oh yes! I miss eating the sorbetes! Perfect for the summer day!